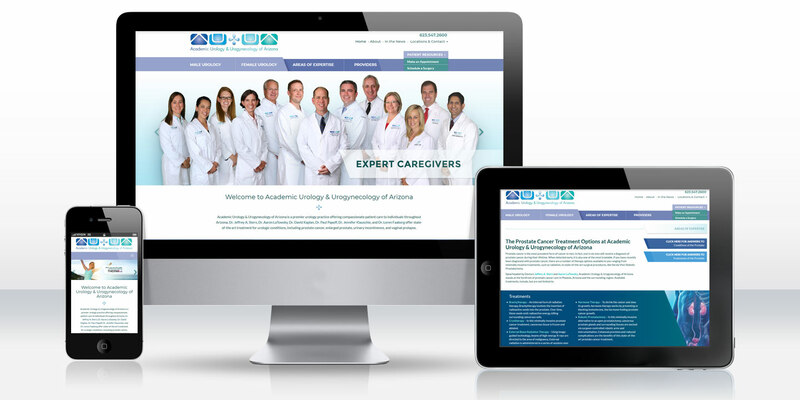 Academic Urology and Urogynecology of Arizona puts a fresh new face on a strong DDA search engine marketing platform with this responsive website design optimized for presentation on all devices and screen sizes. Academic Urology and Urogynecology of Arizona, or AUUA, a long-time client of DDA, decided it was time to redesign the existing websites and create clean, refreshed, and user-friendly platforms aimed at informing and educating their patients. AUUA approached DDA Medical with a clear goal in mind: to utilize the existing marketing and branding and content, and strengthen its digital presence with a redesigned, impressive website accompanied by enhanced navigation. It would be crucial that the new website be fully optimized for small mobile devices such as smartphones, so that the main AUUA website would preserve and extend its rankings in the separate Google mobile search index going forward, and be usable for all devices. The new Academic Urology and Urogynecology of Arizona website would consist of designing a streamlined website dedicated to showcasing and informing of its fundamental services and practice offerings all while utilizing existing content and branding to preserve the existing SEO value of the site. The websites would need to exhibit AUUA’s exceptional knowledge in the field, reflect on the practice’s offerings, and inform both present and future patients of procedures, including remarking on any common questions or concerns one would have. By using AUUA’s established color schemes, DDA would be able to maintain and extend the brand to a new mobile-optimized platform perfectly positioned to capture the over 50% of searches now conducted on smartphones and other small, internet-connected devices. DDA developed a fresh new responsive website design for AUUA’s main site, providing patients with the ability to gain a clear sense of AUUA’s areas of expertise, its technological capabilities, and its renowned providers. The homepage outlines the practice as a whole and includes a general overview menu linking to the subsequent pages, a contact form, make an appointment form, and various services and procedures provided by AUUA which are cross-linked across the site for ease of navigation. The website menu breaks down content by male and female urology, with each section then detailed by conditions and treatments, so visitors can easily find the information that is most relevant to themselves. Rotating banners on the homepage highlight a new online channel in which Dr. Klauschie discusses new urogynocological techniques, and also promote THERMIva, a new vaginal rejuvenation treatment being offered by the practice. The website also includes an appointment form to facilitate scheduling, a news section that allows the client to keep website visitors up to date, and additional information on how to go through the surgical process. The final website keeps AUUA's main website contemporary, with a clean modern aesthetic and responsive website design that allows it to compete effectively for all searches, including on mobile.